Today, it is the turn of Wipro's Santoor Hand Wash, Santoor is a famous brand of Wipro and we are aware of Santoor Soap and its ads. 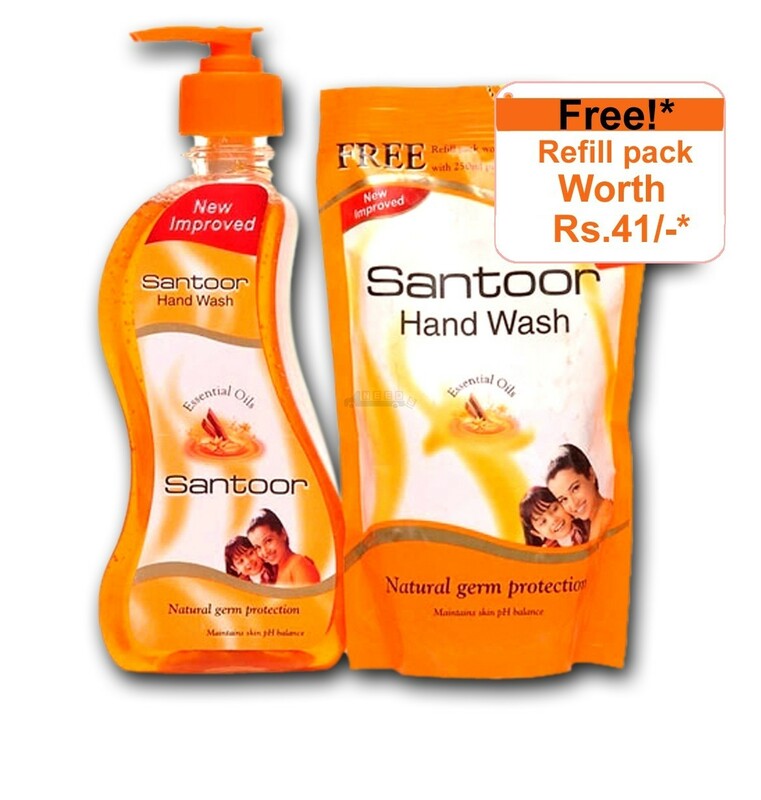 However, Santoor Hand Wash is comparatively a very new launch. In the last few months, I got a chance to use this product a number of times. The two popular brands of Handwash in India are Dettol and Lifeboy and commonly people use them. It is the common story of our home too, Dettol is number one brand hand wash which we use mostly. I got a chance to try Santoor Hand wash because of free offer on Wipro Safewash where you get Two refill packs of Santoor Hand Wash with a large size bottle of Safe Wash.
Today, Hand wash has become an essential product to be used in Indian households and their penetration is only increasing because of increasing awareness among people about the need to clean hands so that bad germs don't enter our body. Therefore, more and more companies are launching their hand wash to tap this market and Wipro is next in this category. Wipro pushed its Santoort Hand wash hard in to market through the aggressive free offers and due to these free offers many people got a chance to use this product. Without these free offers, I may not have used it. The packaging and branding of this product is very good; however, I and my family didn't like it much. 1) The smell of the product is loud and it remains on your hand for a long time, sometimes giving an unpleasant feeling. 2) The cleansing effectiveness of this product is low as compared to the other Hand washes we use. 3) High Price as compared to other Hand Wash products. 4) It takes long time to clean hands with it. In the present fast world, it is very important for any product to work fast and effectively. When we look for a hand wash, then we don't look for a some fancy product, we just look a product which works well. While writing this article, when I smell my hands, then I smell the loud fragrance of Santoor Hand Wash which is still present on my hands even after 45 minutes which gives an uneasy feeling. The company says that Santoor Hand Wash is a blend of natural ingredients and unique formulation; therefore, it kills germs but simultaneously soft on hands. I will only recommend this product to people who need a mild hand wash and those who can tolerate it loud fragrance. The other best way to use Santoor Hand Wash is to dilute it with 30% of water so that we can take control of the fragrance.